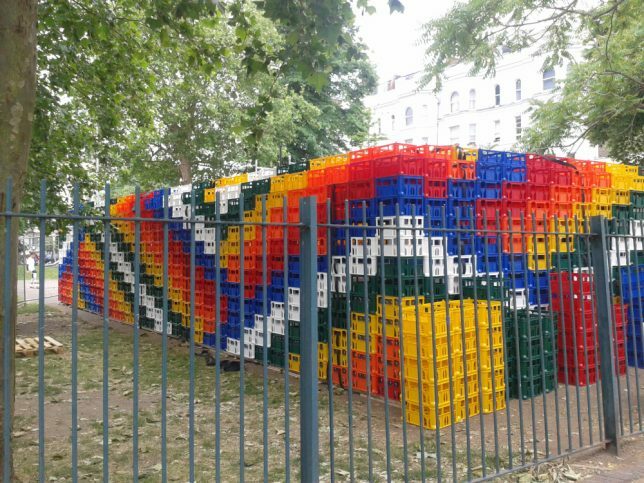 Milk crates are like jumbo LEGO bricks: they’re colorful, lightweight, plentiful, and can be arranged in an infinite number of artful configurations. 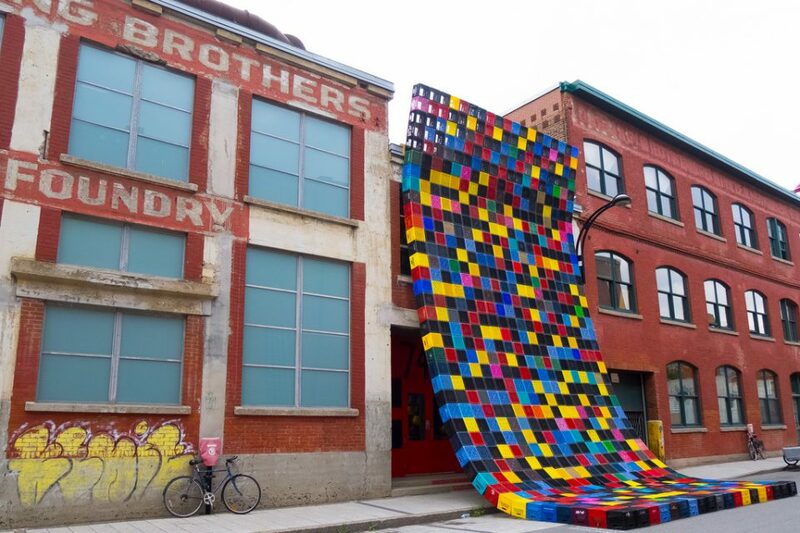 Looking a little like a gargantuan game of true-life Tetris, this monumental milk-crate magic carpet by local artists Philippe Allard and Justin Duchesneau won the Prix Art Public at Montreal’s Gala des arts visuels in 2012. 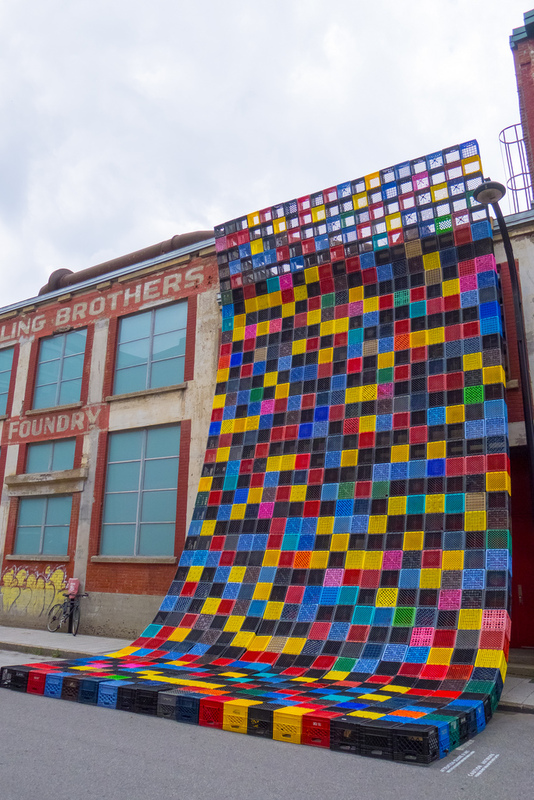 Dubbed “Courtepointe” or “Quilt” in English, the installation was set up at the disused Darling Foundry which has housed and hosted artists studios and an art gallery since the early 2000s. Credit Flickr user taoquay for the above images snapped on July 24th of 2012. Sculpture By The Sea, held annually in Bondi and Cottesloe, Australia, are said to be “the largest free to the public art exhibitions in the world”. 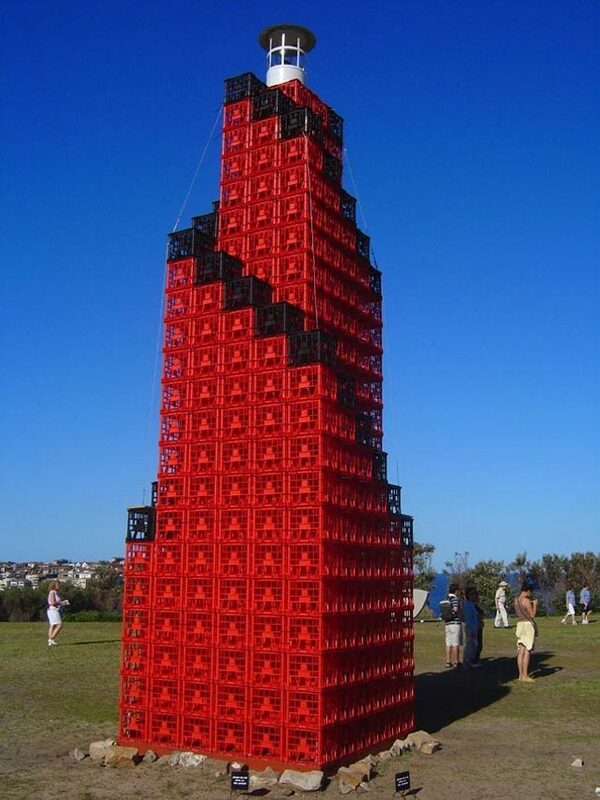 The 2004 edition held along the scenic Bondi to Tamara clifftop walk featured a titanic tower of red and black milk crates built in the form of a lighthouse. No sea cows were harmed during its construction. 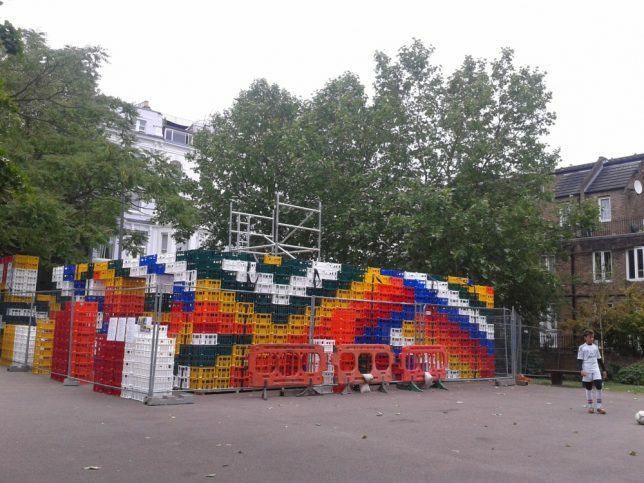 Featured as part of the 2015 London Festival of Architecture, the Art|House was a pop-up commission located in Powis Square. 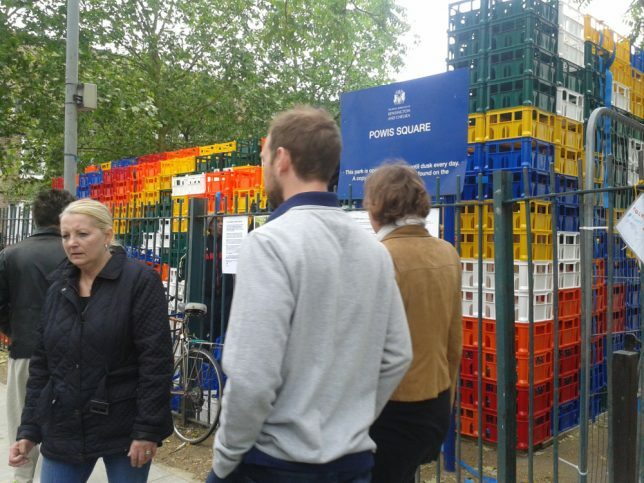 The structure was built using approximately 4,000 milk crates. Designed by Jo Hagan and Use Architects/The Institute Of Light, the house was constructed in such a way that the component crates can either be re-introduced to perform their original purpose or packed down, delivered to any new location, and reconstituted as a sustainable shelter. Wonder what happens when it rains, this being England and all. 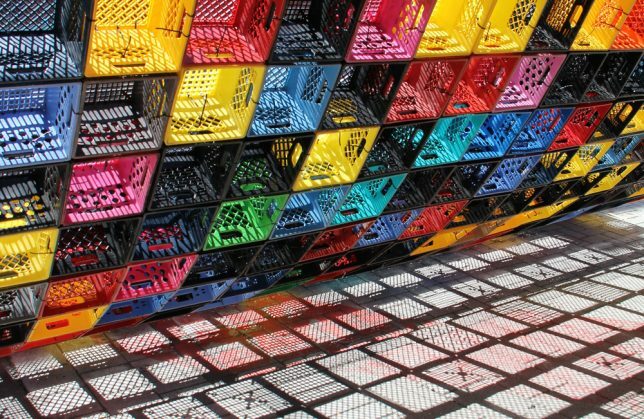 By now you might just assume Australia is the center (or “centre”, as the Aussies spell it) of the milk crate art universe, and that assumption would be correct. 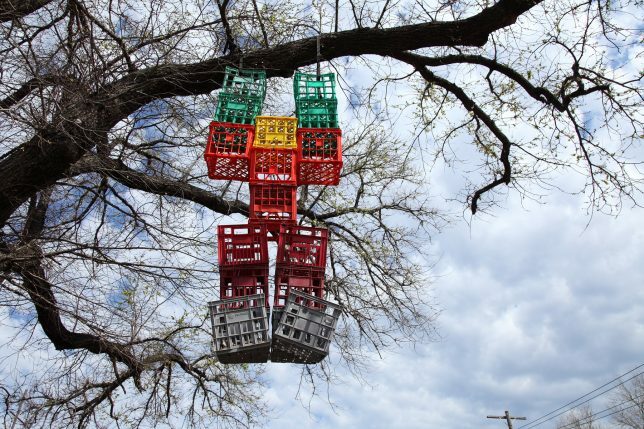 It would seem the ground down under is already saturated with milk crate artworks so there’s now nowhere to go but up – as in the suspended crate man from Footscray, a suburb of Melbourne, snapped by Kham Tran of Kham’s Blog in September of 2011.